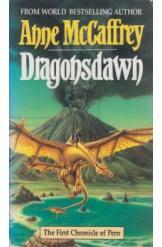 Dragonsdawn by Anne McCaffrey, Sci Fi. Book is in good condition, all pages intact. The story of how the planet Pern was colonized, and of the first generation of human settlers who created dragons from the native fire lizards to protect themselves from Threadfall. A prequel to the Dragonriders of Pern series, and an explanation.